Ontwerp en Erfdeeling van't Land Kanaan, volgens het gezicht van Ezechiel. 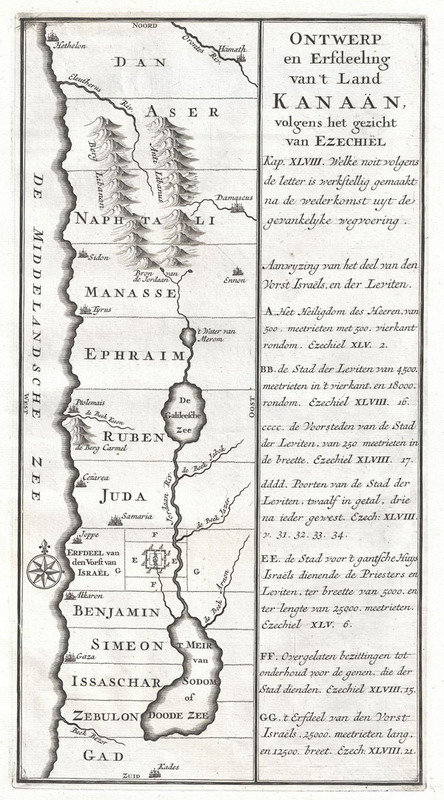 An extremely uncommon c. 1729 map of ancient Israel. This map shows Israel from Hethelon in the north to Kades, just south of the Dead Sea. Divided into the areas controlled by the Twelve Tribes of Israel, from the north these are Dan, Aser, Naphtali, Manasse, Ephraim, Ruben, Juda, Benjamin, Simeon, Issachar, Zebulon and Gad. Shows several important cities including Jerusalem, Gaza, Cezarea (Caesarea), Damascus, Tyrus (Tyre), Joppe (Jaffa near modern Tel Aviv), etc. The right side of the map is dedicated to Old Testament quotations, mostly drawn from the Book of Ezekiel, describing the region. Probably issued in an early 18th century Dutch Bible or other Biblical reference. Very good condition. Very clean impression.